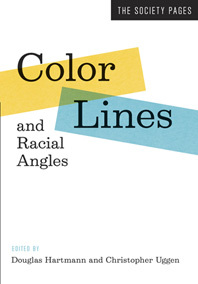 The third volume in The Society Pages series tackles race, ethnicity, and diversity in contemporary American society. As with our previous volumes, the chapters are organized into three main sections. “Core Contributions” exemplifies how sociologists and other social scientists think about race-related groups and topics—in this case the demographics of race, the construction of group identities, and the social psychology of prejudice and racism. Chapters in the “Cultural Contexts” section engage race and diversity in and through cultural realms—ranging from mass media and sports to the environment—in which powerful racial dimensions are sometimes overlooked. Finally, the “Critical Takes” chapters provide sociological commentary, perspective, and reflections on the problematic structure and future of race relations in the United States. Every volume in The Society Pages series follows the same structure. Core Contributions contains a set of chapters by sociologists writing about core concepts and ideas from the discipline. Cultural Contexts essays show students how the sociological imagination can reveal aspects of social life usually taken for granted. Critical Takes essays highlight sociology’s critical approach to social problems and reveal sociology’s impulse toward social action and change. And a Discussion Guide at the end of the volume includes questions and activities created by the editors. Intended to translate the most exciting research for readers who are not trained as sociologists, The Society Pages website features dynamic articles, podcasts, blogs, and roundtable discussions on topics that students care about most. Prominent sociologists contribute articles and participate in interviews that synthesize their cutting-edge research into brief pieces that anyone can understand. Each volume in the series collects the best of the web content into thematic collections, in an affordable paperback format. Every volume in The Society Pages series includes Social Facts—a set of short posts about trends in social data by Deborah Carr. One of the most prominent demographers of her generation, Carr tells the story behind data that frequently gets misreported in the media or misunderstood by nonsociologists. Changing Lenses is the product of an ongoing conversation between sociologist (and The Society Pages co-editor) Doug Hartmann and photographer Wing Young Huie. In each essay, they exchange what's seen behind a camera lens and what's seen through a sociological lens to get at the diversity of perspectives and cultivate a unique look at the human experience.